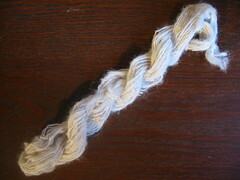 1 - adult alpaca, spindle spun, plied. i spun this from a few handfuls or raw fibre at the spinning day on saturday, the first alpaca i’ve tried. it’s fluffy but quite hard (overtwisted). i found i had to put a lot of twist in to get it to hold together at first but once i’d settled into it i should have reduced the twist. 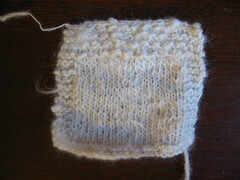 2 - baby alpaca, fluffed, not combed or carded, wheel spun, singles. 4mm needles. i was amazed by this - it seemed really marginal whether it would hold together at all, and turned out a wonderful soft, fuzzy fabric. this was the second yarn i spun on the kiwi after a little bfl top. i kept it as a singles as there clearly wasn’t enough twist to ply. i picked out the largest lumps of vm but hoped the other bits would kind of work their own way out during spinning and washing (some did, some didn’t). i also thought i’d done for it when i washed it rather roughly and it seemed to have felted into one big mass. it withstood being pulled back into strands while wet and skeined off pretty well once it was dry. (i have to add that i LOVE the skeiner - the fuzzy, loosely spun, tangled skein would never have made it into balls without it). there’s a lot of thick-thin variation (very rough average 15 wpi) and i think the needle choice was about right, the fabric’s quite open, but the fuzz fills any gaps nicely. i love this so much i’m seriously thinking about spinning enough for my first jumper - will subject the swatch to a little abuse. i’m sure i’ve heard that alpaca doesn’t pill but that it can shed a lot. 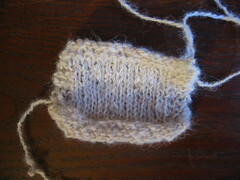 the pattern at the top is (a very rough attempt at) the crocus bud pattern from belle epoque (knitty). it’s the closest i’ve found to what i’m looking for but not quite there i think, i’d rather something with a higher, maybe square neckline, and a little more fitted. i’m also having serious doubts about spinning 500g of the stuff anyway near consistently. 3 - baby alpaca, combed, fluffed, wheel spun. i lost a fair percentage of the fibre in processing. not having proper equipment i busked it with an old comb (plastic, teeth too close together) and a dog/cat paddle brush (like a mini carder, teeth also probably too close together). i can see why joanna recommended combing, that seems to be the most efficient way to get the bits out - might see if i can make a trip to the pet shop and see what they have in the way of combs. while the fibre prep was better i think it’s way overspun for a singles. now i realise it needs a lot less than i always thought to hold together, especially on the wheel where there’s less tension on the fibres so it’s not going to drift apart as you spin. the finished skein has a deal of residual twist (compared to no.2 which hung pretty much straight) and is kinked up in places. i wouldn’t want to weight it while it dries since there’s little enough elasticity in the yarn already, don’t want to kill it altogether. i’ll still knit it up and see how it compares to no. 2 through a few wash/wear cycles, so i can fine tune.